Take a look at our best recommendations, or read the guide section to see how to choose the best A3 laser printer for your business. This article will give you information on everything that you need to know to make an informed decision when purchasing an A3 laser printer for your business. It will look into the suitability of this device for your business, the costs, and other aspects of the buying process to consider, to ensure that you have all of the information you need. For a free price quote from several trusted suppliers, feel free to complete the form at the top of the page. 3. Cheap A3 laser printers 4. What standards can you expect from our suppliers? 5. What is an A3 laser printer? 6. Why should you buy an A3 laser printer? High quality vs. Cheap A3 laser printers – which is best? As with many things, choosing between a large initial investment in the hope for lower maintenance costs against a cheaper, potentially unreliable solution can be a tough decision to make. Because of this, the next section will try to weigh up both options to see which is most likely a more worthwhile investment for your business, as well as put forward certain products that we recommend. It is worth saying at this point that whilst the cheaper printers are not poor quality – and will still be worthwhile suggestions – they may have less functionality, may not last as long, be as capable, or generally be as useful as a more expensive model. In addition to this point, what will make a printer good for your business will be the extent to which it matches you needs. An absolutely top end printer will be able to print quickly and efficiently, at a high DPI (dots per inch), and make use of the latest printing technology (such as auto-detection of printing errors). If your business happens to be a law firm, though, then it is likely that you will require efficient, fast printing – but you may not need a top end DPI, such as 1200 x 1200. Bear this in mind when choosing a printer, or when discussing your options with a supplier, and get the most for your money by buying only what you need. Because they are of a high quality, and usually a higher price to match, high end printers will be equipped with a good range of features that will usually fit all of your needs. For the most part, it is unlikely that you will have to sacrifice certain features, as at the higher end, most features come as standard, such as higher printing speeds, good quality printing and so on. This guide will separate our picks for the best high end printers by business type, but remember that if your business type is not mentioned, it does not mean that these printers are not suitable for you. Think carefully about what you need printing-wise, and choose the best printer that suits these requirements. A marketing agency will likely require a printer that is a bit of a jack-of-all-trades. Decent printing speeds, good connectivity, a useful range of features and a good printing quality – to print all things from documents, to presentation slides, to advertising proofs. Lexmark’s X925DE can do everything that you are likely to need, well. With the ability to print, scan and copy, USB and network connectivity, a fast printing speed and good quality printing, it will handle everything you throw at it with ease. A large memory capacity, as well as duplex printing, and with Eco-Mode to help your reduce your paper and toner usage, the X925DE is a simple and easy-to-use printer with low running costs and a wide range of features that will suit your needs. Producing high quality, bright and colourful prints will be crucial for a design company. A varied range of paper weights and printing sizes will also be beneficial, so a flexible printer is necessary. Another entrant from Xerox’s excellent Phaser range, the 7800DN this time has designers in mind, printing excellent quality images made possible with Xerox’s new HiQ LED print head technology, allowing the printer to produce printing resolutions of 2400 x 1200 dpi. Printing on 75-350gsm media, and up to 300gsm double sided, as well as the ability to print posters, banners, booklets, brochures and business cards, makes this printer a great choice for any design company. The printer also comes with 2GB of onboard memory and a 160GB hard drive, meaning you will not be limited by your printer’s memory capacity. Not all businesses will require colour printing – often those that deliver large amounts of mono printing instead. These can be law and insurance firms printing large documents and contracts, for example – although these prints must still be fast, and of a high quality. Dealing with lots of queued jobs will likely be a requirement, as well as duplex printing and booklet support. The Kyocera FS-9130DN allows for a large paper capacity and fast printing speeds, alongside duplex printing to ensure your business’s printing needs are easily met. The printer comes with eMPS job management functionality and Kyocera’s long-life ECOSYS technology – meaning low cost for consumables, maintenance and administration. Whilst many may think that faxing is an out-of-date form of communication, many other businesses still rely on it, and some simply prefer it. Doctors, in fact, are bound by law to send sensitive patient documents via fax, as this means the information will not be susceptible to email hackers. Multifunction printers incorporate various features and attempt to cover as many tasks and requirements as a business will ever possibly need. They will have excellent connectivity, speeds and printing quality, as well as many additional features that will make them stand out. A massively efficient MFD (multifunction device), HP’s Enterprise Flow has excellent printing speeds and plenty of efficiency features including duplex printing and a document feeder. It offers high-quality printing, coupled with HP EveryPage that detects any potential errors or pages that have been missed, to ensure the highest quality output as possible. The printer offers print, copy, scan and fax functionality, and 20.3cm colour LCD touchscreen display, a huge paper capacity and more – a true office workhorse that will suit your every need. Cheap A3 laser printers – are they worth it? As mentioned earlier, printers at the lower end – and lower price range – will not automatically be of a worse quality. Instead, they will be good in certain areas, rather than most areas, and may lack certain aspects of functionality that you would expect from a higher end printer. This is not to say they will not be equally as useful as a more expensive printer, however. Put it this way – a printer that can scan, copy and fax, print in colour and comes with a 20cm touchscreen interface, will most likely not be necessary for the vast majority of businesses. Some businesses may not need super high quality printing resolutions, or high printing speeds, for example, and may only require a printer that can make booklets well, for example in a classroom. If you would like to save money for your business, then ensure that you look for a printer that does what you need it to do, without spending extra on a printer with added functionalities that you may not need. What standards can you expect from our suppliers? We pride ourselves on the high standards that our suppliers set, for example Pitney Bowes, ranked as the number 1 international ecommerce and fulfillment technology provider in the 2018 IR1000 Vendor Report published by Internet Retailer. This is just one example of the quality that we aim for when selecting the right suppliers for your business. If you would like to find this out for yourself, simply fill in the form at the top of the page to get a personalised quote for your needs. What is an A3 laser printer? As a business owner, you probably already know what an A3 laser printer is – but for those who are not business owners, or simply do not know, here is a quick recap. A3 printers an extremely intelligent method of printing an electronic device. Contrary to what many would expect, they do not print using wet ink, but toner, instead. The toner consists of super fine ink particles that are rolled onto a piece of paper and melted onto the page, fusing with the fibres – hence why pages are always warm when they have been printed. An ‘office workhorse’, A3 laser printers are a very quick and versatile solution for most business needs, able to handle a wide range of office tasks and complicated printing. Various steps forward in technology have made laser printers more and more effective and widely-used, as they decrease in size, but increase in productivity. There are a large number of A3 laser printers on offer, and it can of course be a tough decision to make a large investment as a small business owner, when your focus may likely be on preserving cash flow and keeping costs down. As a result, this article is here to help you make that decision, and to take you through the different aspects that you should be looking for in a printer. Why should you buy an A3 laser printer? Having a printer that can also print A3 means a greater level of capability in your office/workspace, as well as home environments, if needs be. Usually, A3 printers will have more powerful hardware, meaning faster printing of A4 documents. Additionally, they will take much larger toner cartridges, and can handle more work, meaning less maintenance. The ability to print double sided, as well as other new features, has made the laser printer the greater option between it and inkjet printers. An A3 laser printer will aid any creative roles in capturing all kinds of images on paper, whether it be an architect’s design or a blueprint for customers, as well as other roles and needs such as photographs and presentations. Laser printers are excellent at handling heavy workloads, especially when printing lots of black text documents – although they can also produce professional-looking business graphics, too. It can do this, all while remaining a better investment in the long run, too. The printer itself will be more expensive than most inkjet printers, however it will print a lot more pages from one toner cartridge. This means that the cost-per-page – arguably the most important metric in printing – for laser printers will be much lower. There will, of course, be a huge range of situations in which you will need an A3 printer. Some will not be as relevant to your business needs, however this is more of a comprehensive list. Feel free to consider whether you have needs that are missing from this list, too. There will, of course, be different needs for different business types, too, that have not been mentioned. An example would be a school, who will have huge printing requirements, for documents such as exams, letters, worksheets and more. Equally, businesses dealing with contracts on a daily basis, such as law firms, will have similarly large printing requirements. As a business owner, or a person in a position to be considering a new printer, you will understand what you and/or your business needs, and whether you will benefit from an efficient, reliable and high quality laser printer. Should this be appropriate for you, feel free to read on, where we will go into much greater detail about the buying process, including features, costs and more. If you have already decided, though, that you do require a laser printer, fill in the form at the top of this page. It will take a very short amount of time and you will be put in touch with several trusted suppliers who will be able to suit your needs and give you a fantastic quote. With such a large amount of printers on offer, it is important that you consider what your business needs and make sure this is a priority when you choose your product. It may be that you do not need your printer to print colour, or perhaps you do not have much room in your office, so you need your new printer to be small enough to fit. Monthly duty cycle Duplex printing Single or multi-function printing? Probably the most important aspect to consider, is whether you need to print in colour, just in black (monochrome), or both. Monochrome printers will, for the most part, be cheaper than colour printers, although the difference in price is usually small. As you would probably expect, though, colour A3 laser printers will be more expensive than their monochrome counterparts, so this is something to keep in mind when considering how you would like to print moving forwards. Depending on the requirements of your business, this will be a crucial factor to consider. Speeds will obviously differ across various manufacturers and models, but the decision is relatively simple. Generally speaking, printing speeds of anything less than 20 pages per minute (PPM) are more suited to small office environments with less printing requirements. Any higher printing rates will be more suited to medium size (or growing) businesses, and, of course, the highest speeds will suit the largest businesses with very large printing demands, around the region of 80+ PPM. Printers at the top end will hit an absolutely huge 100 PPM – but obviously, their cost will reflect this. Having additional features such as automatic feeders, stapling and folding, collating and other relevant additions will save you a lot of time in the long run, especially if you will be printing a large amount of of documents regularly. There are several options for how to connect to your printer, that are not all always supported by every printer. Printing by connecting to the printer via USB will not be a suitable solution for many businesses, and will be a time consuming and tedious task if your business has large printing demands. It is recommended that, unless there will only be one person printing, then you should stay away from USB-only printers. 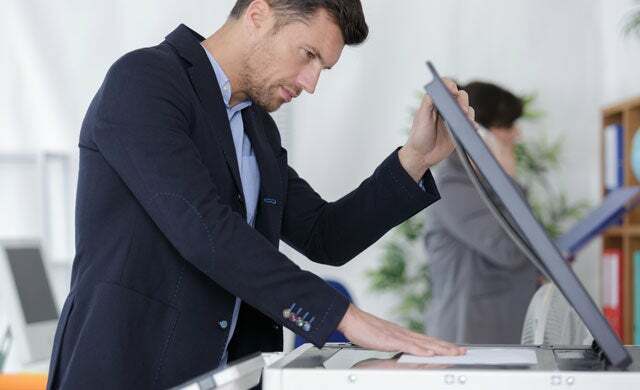 A better option, and indeed the standard, is to connect your printer to your local access network via an ethernet cable, meaning that anyone connected to the LAN will be able to connect to the printer. This will ensure a much greater level of productivity, as people will not have to reconnect via a USB each time they want to print – which can be even more disruptive if the printer is not nearby your workspace. The only real downside to this, however, is that as you will be connecting your printer to the LAN, the place in which it will reside will be dependant on ethernet cable access – so this is something worth keeping in mind that man would not consider. Wireless printer connectivity can cover various forms (this obviously includes the previous Ethernet and Lan section). Email printing, available on selected HP printers, is where you email the document straight to your printer. NFC connectivity will allow you to tap your printer with your NFC-enabled device (usually a mobile phone or tablet) and more. Another option is to simply connect wirelessly straight to the printer. iOS devices can connect via Apple AirPrint, which allows APple devices to connect directly to the printer, while Android devices can benefit from similar connectivity via Google Cloud Print. Most business printers now come with embedded web pages or other relevant tools for easier management and use over your network. With an increased capacity and printing capability comes a larger device, and this is something that is absolutely imperative you make sure you are aware of. You should know the exact dimensions of your chosen device – and indeed the place you will be putting it – to ensure there are no issues with the installation of your new printer, as this will waste time and money. The larger devices will tend to be floor-standing printers, while the lower-volume machines can probably fit on your desktop, if this is something that you will benefit from. A3 printers will obviously be able to print in A3, and most likely A4, but it is important to make sure you know exactly what size printing you will need. Misusing your device to print page sizes that it does not support could result in you damaging the printer, which will cost you in repair costs. Main takeaway: make sure you know both what you want from your printer, and what your printer is capable of – especially if your business requires more non-standard printing sizes, aside from A4/A3 and so on. A2 printers do exist, so if this is something you may need, it is worth doing some research to ensure that your needs are met. Manufacturers do not make their money on the printers themselves, for the most part. Their profits come from the sales of toner and other accessories, so it is absolutely crucial to know that you are not just paying for a printer, but it’s lifetime requirements, too. Do not be put off by this – as a rule of thumb, the more expensive a printer is, the cheaper it will be to run, but just make sure you are aware of the costs of toner, staples and paper, as well as any other requirements your printer may have. Luckily, laser printers are very efficient, especially when compared to inkjet printers. Inkjet printers self-clean themselves using toner that is therefore not used to print – laserjet printers do not do this, meaning they are more toner efficient, and print more pages per cartridge. With mono printing (black toner), aim for around 1 to 3 pence per page, and around 3 to 6 pence for colour. This will likely not be listed on most product websites, but some printers can be especially noisy, and this can lead to be distracting if the printer is near enough to where you will be working. Getting recommendations from other purchasers, asking suppliers and even trying to look at the printer in person are all good ways to avoid this. Do bear in mind that a large printer is likely to be relatively loud regardless, however – but do not let this put you off: the noise of printing usually becomes white noise very quickly, often useful for productivity. Make sure you know how you will actually be transporting your new printer to your office/premises. If you do not have the facility to do so yourself, then you will need to ensure that your supplier provides a delivery service. In many cases, these services can potentially be free of charge, however, it is definitely worth making sure you are aware of these potential costs to ensure that you are prepared for them. Usually, printers will have a monthly duty cycle that states the model’s recommended maximum prints per month without damaging the printer. This is usually part of the small print and is definitely something that most people miss. To avoid coming into any problems with this, try and generate as accurate a guess as possible as to how many prints you will be doing per month. Obviously, the phrase ‘how long is a piece of string’ comes to mind, so perhaps try to consider your printing needs in a day or week and extrapolate this over a month. Make sure that this estimate is much less than your new printer’s maximum monthly duty cycle – otherwise, expect repair costs heading your way. As a general rule of thumb, the higher a printer’s monthly duty cycle, the better the build quality. This is the technical term for printing on both sides of a sheet. This will be useful to save paper and reduce your carbon footprint, but it will also be useful from a design perspective, should you need to print double sided leaflets or brochures. Duplex printing is not necessarily automatic – beware of ‘manual duplex’, where you will need to turn over the paper and feed it back into the machine yourself. At this point you should consider what else you will need from your printer, besides the actual printing. You may require it to scan documents, work as a photocopier, and even a fax machine – in which case you should look for a 4-in-1 multifunction device. You may not need to send faxes, in which case you should look for a 3-in-1 printer, or perhaps just a simple copier-scanner. Obviously, these will be cheaper, but may limit your options in the future. Do you want a display on your printer? Simple or full LCD? How much internal memory will you need? Multipurpose tray or manual feed slot? As you will be able to see, there is a lot to think about when deciding on which A3 laser printer is right for you. If you feel like you have enough information by this point, and you are ready to receive several trusted quotes from our suppliers, fill in the form at the top of this page. Many of you, however, will still be looking for more information, so read on to find out about the difference between a high and low cost printer (and the argument for both), the costs involved with purchasing and maintaining an A3 laser printer, and ways that you can deal with these costs. When calculating the cost of your new printer, it is very important that you bear in mind that the upfront price will not be the only cost involved. This may seem obvious, but it can be easy to forget that maintenance and supplies for your printer can often cost more than the printer itself quite quickly. This is one of the reasons that it is often more worthwhile to invest in a higher end printer that will likely be more cost-effective and use less toner when printing, as well as require less maintenance and last longer. The two main costs that should be kept in mind are maintenance costs and supplies for you printer. Fuser assembly – including damaged paper sensors, electrical failure and power supply, cleaning toner build up, torn fixing film sleeves, worn feed and transfer rollers, damaged gears and the heating element’s Quartz bulb failing. Often, vertical lines on your printing will often be a sign of scratches on the rollers caused by a build up of dust/dirt. Rollers and assemblies – Rollers that have become worn should be replaced. The paper versions can be cleaned with chemicals and a damp (lint free) cloth. Adding RAM – while this may seem odd, upgrading your printer’s RAM – assuming it has the capacity to do so – will ensure your printer can handle high resolution images with much greater speed. It is advised that if your printer needs maintenance, seek advice first, as any mistakes may void your warranty, or worse. Paper and toner will be a constant cost for your business, and it is important to bear this in mind when planning your finances, as well as during your initial purchase of a printer. Buying paper for your laser printer can actually be more complicated than you would expect. Because of the heat used in fusing the toner to the page, laser printing paper must be able to stand a high heat. It must also not have too much of a coating, like inkjet paper (to help absorb the ink), as it may melt and damage your printer. Paper will also come in different weights – the most common is probably around 90 gsm, but make sure you know what your printer can handle, as incorrect paper can cause jams and further damage. Plain office paper will usually suffice in a laser printer, as they can usually provide excellent printing quality on general purpose paper – but it will not be the best if you are looking for the utmost quality. Toner can be very expensive, although toner cartridges tend to have a much higher yield than inkjet cartridges and will therefore last much longer, making laser printers cheaper to run in the long term. The upfront costs of a new printer can be daunting for some businesses, and perhaps unmanageable. Fortunately, paying for a printer up front is not the only option for businesses – often, renting or leasing a printer can be a more cost effective solution. Rental agreements run from one month to the next, with no long term requirements. At the end of the 30 day period, both parties can change the terms of the rental agreement. This includes dates of pay, rental price and so on. If you would like some information about renting a photocopier, read our guide on photocopier rental leasing. By only paying a small monthly fee, companies can afford to rent higher end printers that would otherwise be out of their normal price range when paying in full up front. Rentals in particular can be done on a rolling monthly contract, meaning your business will not be locked into a long term contract – and usually, these contracts are easily cancelled. In addition to this, you will be able to change your printer whenever you need to, meaning you can find a better match for your business, whether this be a long term solution, or short term during busier or quieter periods. Usually, your rental contract will include all maintenance and supplies, meaning you will avoid unexpected costs and get expert assistance as and when you need it. If new hardware comes onto the market and your supplier has it in stock, you can upgrade quickly and stay on top of any new features and trends. The main reason you would probably consider renting is simple: your business may not be able to afford the large upfront cost of a printer – so by renting you can reduce this to a small monthly sum. Be very wary of low cost rental contracts, which are – like many things – usually too good to be true. Pay close attention to the smallprint, which will often reveal a large deposit requirement. You may also be forced to make additional payments throughout your contract to ensure that your low rental cost stays the same. Maintenance charges will always come separate from your rental agreement, as rental agreements are usually paid on a ‘cost per copy’ basis. Be sure to check whether your agreement has a minimum billing amount that you will need to pay despite whether you make an copies a month or not. Monthly rental fees will usually be more expensive than leasing fees due to the nature of their shorter, more flexible contracts. Eventually, renting a printer will likely become more expensive than if you bought it outright. These have all been summarised in the table below. A lease agreement will have a set term – for example 1 year/12 months – in which both parties must adhere to the agreement throughout. Neither can change any aspect of the agreement without breaking the lease. Gives businesses with less capital a chance to get a high end printer for their business without a large up front payment, by spreading the cost over several years. Leasing payment schemes help your business manage cash flow by being 100% tax deductible. As per the terms of leasing, the monthly price your business will pay cannot change during your agreement. When your agreement comes to an end, you will be given the option to purchase the printer at its current Fair Market Value (FMV). Leasing contracts can tend to be very long, often three years at a minimum, which could present an issue for businesses for several reasons. Your business could quickly grow out of the product you are leasing – or not require it anymore. It can be hard to predict what your business will need in 3 years time. There will be fees involved if you want to end your lease agreement early, change the terms, or upgrade/downgrade your printer. You are legally obliged to complete all payments according to lease agreement, even if your company fails, or you do not want the printer anymore. If you are looking for more information on photocopiers, visit our page on photocopier rentals – and if you are looking for our picks for the best office photocopiers, read about our top 5 office photocopiers. Hopefully this guide has presented you with enough information to help you decide on whether you want to purchase/rent an A3 laser printer for your business. If you would like to receive several tailored quotes from some of our trusted suppliers to help you find a printer that is right for you, then fill out our form. Compare Photocopier Prices & Save Up To 40%! Do you already have a photocopier?